To get this Journal moving, we will have to institute an initial set of rules for papers and articles submitted for publication. They cannot, and should not, last for too long, as they will certainly become liabilities as the Journal progresses and builds its committed readership and body of contributors. But, in the first pangs of its birth, we must ensure that the babies produced are not too fat. We should therefore impose a limit of around 1000 words per paper (this may be increased at a later stage) with the proviso that if you have more to say than can be squeezed into this limit, then we will certainly entertain the contribution split as a sequence of papers spread across several issues. This will have several advantages. It will deter the overly verbose, who can't say anything briefly, but it will also always leave a great deal left to be said. We expect that both the paper's author and those who read it and feel that they too have something to say, will want to add necessary sequels and riders or disagreements, will have no difficulty with producing within this limit. We hope after all, to generate a discussion... but we must ensure that it is different from (for example) the letters section in New Scientist, where the contributions are much too small, smart and "clever". That sort of constraint leads not to healthy debate but to what they call on the Dave TV Channel "witty banter"! We will constantly be reviewing our catalogueing and archiving policies to deliver the best possible service to our readers. Participants must realise that for this Journal to prosper, the initiators must exercise some editorial control. We could not for example allow a small number of contributors (with time on their hands) to dominate the content. Neither can we let Strands become interminable disagreements - there are many academic Journals for such things. This Journal is meant to be a living heart for real seekers of Truth. If you like the sound of your own voice, please invest in a small portable recorder, and make your own ideal library, that can always be with you and with which you can amuse your friends. Finally, it is not our intention to keep the contributors PC and safe. The initiators are NOT subscribers to the consensus, and their own contributions are frequently not only in oppostion to such positions, but attempt to establish new, quite contrary sets of ideas. If you genuinely discover or invent, this is the place to publish! Though all contributions published will be available as downloadable PDFs, the copyright remains that of the author and not SHAPE or E-Journal. Please affix copyright name and date to any work submitted. The main intention must always be living content, not its universality. We are not providing a Wikipedia, but an intellectual (but non--academic) forum for new and challenging ideas in Philosophy & Science. If we do our job right, it will become an exciting place to visit for all interested readers, to see "what new stuff is available today?" I have personally participated in several "forums" which at first showed signs of being what I have described only to be taken over by egotistical types, who would argue interminably about nothing. The difference here is that we are teachers and never dictators. 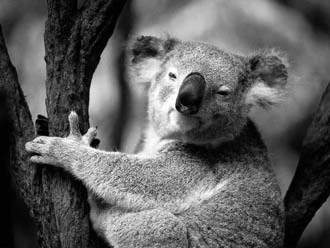 The Up-A-Gum-Tree method of teaching and discovery should be our emblem: a Koala Bear (or intelligent primate) on the top of a fruitless tree, surveying the surrounding real world.